On gaiagps.com, use the drop-down menu by your profile picture to open the Waypoint page. Desperately need the ability to edit the coordinates on gaiagps.com. Placement of waypoints by visual identification is pointless in a field of sagebrush with no roads. Editing coordinates on the apps is possible, but very time consuming and error prone. Agree. Would also like the ability to edit the GPS coordinate of a Waypoint or to simply add a waypoint by coordinates. Been waiting for this feature too! I find it pretty surprising that a web based application like GAIA doesn't allow the user to input GPS coordinates manually to mark waypoints on a GPS referenced base map. Garmin Mapsource, Google Maps, along with every other mapping product out there has been doing this for years. C'mon fellas. This is pretty basic stuff. I’ll add to that that it should be possible to add waypoints within a route. This is a big problem when you have planned a route and want to modify it. Or am I missing something? 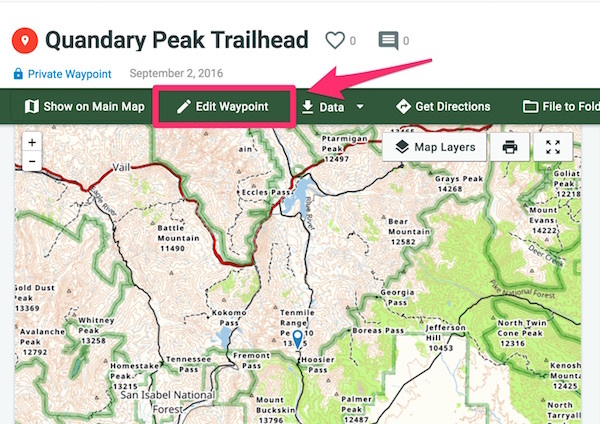 You can add a waypoint to a route by clicking on one of the routepoints and then select the waypoint icon. You can also add new route points by clicking anywhere along your route.